Reality Sets. Beyond Virtual Sets For Chromakey Green Video Productions. 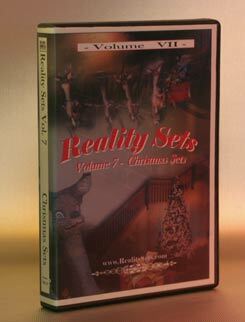 Reality Sets Volumes Image Gallery. Sign up for Free Reality Sets Promotions - Here. Looking for virtual sets? Get Real! Beyond Virtual Sets for chromakey and greenscreen shooting - Reality Sets take your green screen video production projects to a whole new level. Forget the cartoon look of standard virtual sets, put your talent on location! Film your green screen video production segments and drop the Reality Set of your choice into the background and your talent is in the location of your choice! Video productions using normal computer created virtual sets can't compare. Fully compatible with all NLE systems. Great for Serious Magic's Ultra! Take your productions to the next level - Get Real - Get Reality Sets! It has been the subject of more than 300 mail requests - We listened! Starting today we have launched a pilot "Buy N Download" program. Announcing: The Establishing Shots Video Library! Reality Sets News - New product line released! tool in virtually EVERY movie & TV show created since the 1950's. It is likely that you have never used them in any of your own productions!